Indian Army is going to recruit fresher candidates in India for Short Service Commissioned Officer Posts. So, those candidates who are willing to work with this organization they May apply for this post. Last Date of Apply 15-May-2017. Total numbers of vacancies are 56 Posts. Only those candidates are eligible who have passed BDS/MDS from a College/University recognized with 55% marks by the Dental Council of India (DCI) for the respective batch/year and who have registered themselves as Registered Dental Practitioners with any State Dental Council & completed one-year compulsory rotatory internship by 31 Mar 2017. 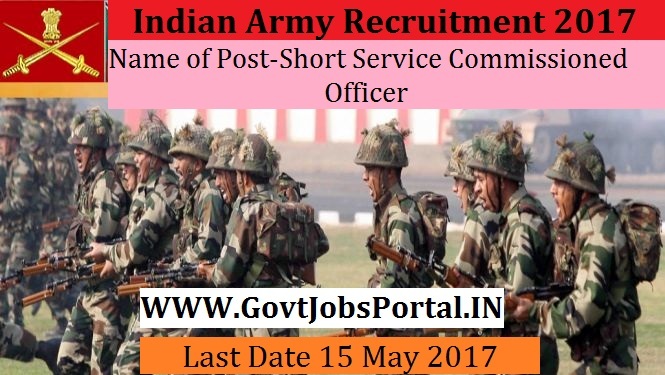 Indian citizen having age in between 21 to 45 years can apply for this Indian Army Recruitment 2017. Those who are interested in these Indian Army jobs in India and meet with the whole eligibility criteria related to these State Cooperative Apex Bank Indian Army before applying. Educational Criteria: Only those candidates are eligible who have passed BDS/MDS from a College/University recognized with 55% marks by the Dental Council of India (DCI) for the respective batch/year and who have registered themselves as Registered Dental Practitioners with any State Dental Council & completed one-year compulsory rotatory internship by 31 Mar 2017. 2:Selection will be held on Medical Examination.